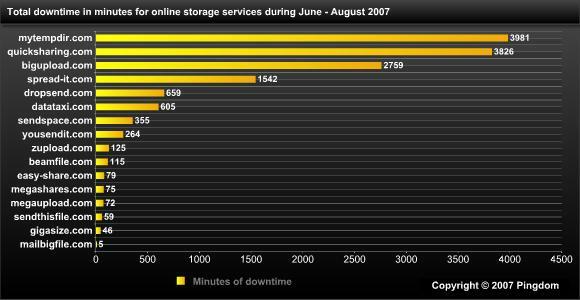 This is a survey of the uptime of 16 online storage services during June – Aug 2007, showing some striking differences in availability. The service with the best uptime only had five minutes of downtime in three months, while the service with the worst uptime had more than 66 hours of downtime during the same period. It is becoming increasingly common to store and share files online, and there are a large number of websites that offer this service. Whether they are business documents, videos or images, once the files have been uploaded from your computer to the online storage service of your choice, your ability to share these files depends on the availability (uptime) of the service you are using. Many of these storage services also offer paid options, often as online storage solutions for companies and advanced users. That makes it even more important that they have a very high availability. After all, a file storage solution is useless if you cannot access your files. Ideally these services would be up and running and fully available 100% of the time so you can always access your files. However, this is not an ideal world and there are a lot of technical challenges for these services to provide a reliable website, including potential problems with servers and networks. This is not a unique problem to online storage services, but to all websites and services on the web. Above: Downtime in minutes for 16 online storage services. For more data, including a month-by-month breakdown, see the table at the bottom of this article. As you can see from the diagram, the availability of these services vary enormously. The service with the worst uptime has 796 times more downtime than the service with the least downtime. It is also clear, especially when looking at the monthly downtime numbers (available in the table below) that the difference from month to month can be significant. An excellent example is MyTempDir which had very good uptime both in June and July but ran into serious problems in August when their service was unavailable for hours on end, in one case 22 hours in just one day. There is of course more to a service than just availability. Usability, support, download and upload speed, storage space, and many other factors should be considered when choosing an online storage solution, and also whether it is intended for private or corporate use. The numbers we provided in this survey are just one thing to factor in when (and if) you make a decision. For a monthly breakdown, here is a table with the monitoring results. The columns show downtime, i.e. when a website did not respond or gave an error. Excel file with the survey data. Note: We (Pingdom) measured the availability (uptime) of the websites of these services. Download and upload performance of files and other functionality was not tested or monitored.